After Zachary Sporn ’16 (Athens, Pa.) graduates next year, he plans to become a physician and perform research on neurodegenerative disorders. 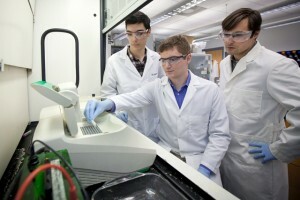 Zachary Sporn ’16, Michael Rockman ’17 and Professor Justin Hines work in a lab in Hugel Science Center. Dana Lapides ’16 (Doylestown, Pa.) hopes to become a university professor and conduct research on nano-scale mathematical and physical problems. Both students are one step closer to attaining their goals after receiving Goldwater Scholarships. Awarded for academic merit, the Goldwater is the premier undergraduate award of its type in the fields of mathematics, science, and engineering. Each student’s award will cover college costs up to a maximum of $7,500 next academic year. A biochemistry major, Sporn is working with Justin Hines, assistant professor of chemistry, on research that could bring about a better understanding of neurodegenerative diseases such as Alzheimer’s and Parkinson’s. Funded through a three-year, $268,220 research grant from the National Institutes of Health (NIH), the project looks at how the interaction among proteins in the body can lead to disease. Sporn was a coauthor of papers published in Prion and PLOS (Public Library of Sciences) Genetics academic journals, and he presented the research with Hines at the American Society for Cell Biology/International Federation for Cell Biology joint meeting. He has also been very active in Alternative School Break, serving communities in Boston and North Carolina. Dana Lapides ’16 performs during the annual CaPA Cabaret. Lapides, a mathematics major, worked with James Ferri, James T. Marcus ’50 Professor and head of chemical and biomolecular engineering, on research exploring ways to increase the stability of water/toluene emulsions. She presented her work at the 2013 Annual AIChE Student Conference and the 2014 AIChE Mid-Atlantic Regional Conference, where she won third place in the research paper competition. Last summer, she worked on geometric intersection graph problems at Willamette University’s Mathematics Consortium Research Experiences for Undergraduates program. She is spending the year abroad studying in Budapest, Hungary. 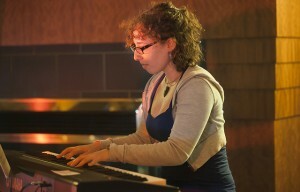 Lapides is a Creative and Performing Arts Fellow with a focus on piano performance. She plays in the Contemporary Music Ensemble, is co-founder of the Yoga Club, was secretary for Lafayette Association of Visual Artists, and was a member of the McKelvy House Scholars program. For information on applying for scholarships and fellowships, contact Julia A. Goldberg, associate dean of the College, (610) 330-5521.